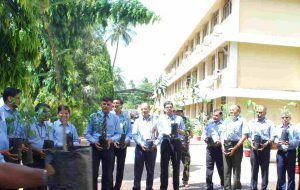 RAdm Mital in his speech motivated all the GSL employees to plant more and more trees in order to make the surroundings green. RAdm Mital said, “It is important to look after our environment in order to make earth a better place to live.” RAdm Mital also spoke about threats to the environment and asked everyone to initiate ‘go green’ effort at individual level. Further, a tree plantation drive of 250 plants at various places such as GSL unit 2, Sada and GSL Officail Colony at Chicalim is being undertaken by Goa Shipyard limited. Fruit, flowers and different useful trees will be planted under this programme. World Environment Day occurs on 5th June every year , is the United Nations’s principal vehicle for encouraging worldwide awareness and action for the protection of our environment. First held in 1974, it has been a flagship campaign for raising awareness on emerging environmental issues from marine pollution and global warning, to sustainable consumption and wildlife crime.